A Visit to a Science Fair Essay. Welcome to our website. This is the one of the best and an unlimited the source of Essay and Paragraph. 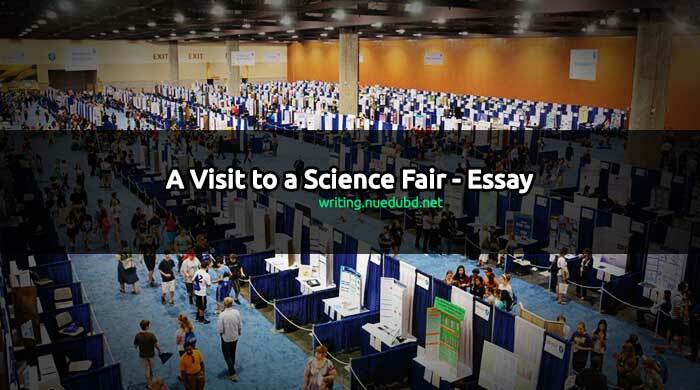 Now NU EDU BD writing section sharing the most useful A Visit to a Science Fair Short Essay for you. I hope you'll like it. Education is one of our basic rights. This is a very short and easy essay for you. Now check this out Short composition on A Visit to an Science Fair for you. Introduction: A science fair means the fair where the scientific equipment, tools, instruments or machines are exhibited. This type of fair exerts a greater attraction for every one of us. I never lose the opportunity to visit where this type of fair is arranged within my reach. Importance of science fair: Science fair has immense importance. It diverts the young generations to the path of science. It encourages them to invent newer and newer things. The young mind is always motivated by scientific knowledge. If this type of fair can be arranged, our young generation can get opportunities to observe the scientific technologies from close quarters. Not only that, this fair has much business value. So, this type of fair should be arranged every now and then. Occasion and place of the fair: Last week, I paid a visit to a science fair arranged in Dhaka on the occasion of the National Science Week by the Dhaka Science Museum. I was highly amused at this fair. I got golden opportunities to see the magic of science. As longs as I passed time there, I felt I was entering into the vast horizon of scientific knowledge, It opened my knowledge and I started inspecting everything with rapt attention and closeness. Overall arrangement: the authority took a fair and equitable arrangement on the occasion of this fair. The Surrounding place was finely decorated. There were two entrances. Inside the pandal, everything was arranged smoothly. There were stalls of different associations or companies. There is open space for the visitor to pass time there. The security was enough. Communication was fine. The exhibits were arranged in such a way that the visitors could reach and see each of them without any difficulty. There was a good arrangement of lighting and other amenities. I was really pleased observing all these arrangements. Things exhibited: At the fair, there were different stalls containing numerous scientific instruments. I saw the models of motor cars, trains, ships, airplanes etc, X-ray machines, different surgical instruments were arranged there smoothly. There were also products of jute fiber and jute stalk which appeared to be of greater practical value. The science fair held in Dhaka last week was an impressive one. Visitors from both home and abroad came to visit here. The most amusing thing was the making of a motor car by our local scientist. This motorcar will be run by mustard oil instead of petrol. All our native visitors highly praised this scientist who was also present there. Even the foreign visitors also eulogized our young scientist. However, some other scientists also exhibited their inventions there. The making of surgical thread from the lobster crust, the cheapest paddy thresher, the remote control light was another attractive thing exhibited there. A popularization of the science fair: the science fair has got more and more popularized day by day. Our people are being highly inspired by this. Realizing the importance of this, different organizations along with the government are taking preparations to arrange this every year. Some defects are seen by me: I was highly impressed by that fair. I saw no glaring defects there. But lack of sufficient space and high entry fees were disturbing to me. Even the exhibition of foreign organizations was dearth there. Conclusion: Science has done a huge benefit for us. And science fair can give us opportunities to observe the spell of science by our own eyes. Thus this fair should be arranged for the betterment of our own nation.